It started with one kid, but didn’t take long before the other started getting it. Runny, but congested noses. Coughing like they are hacking up a lung. Slight fever in one of them. Though, they are still acting mostly normal. 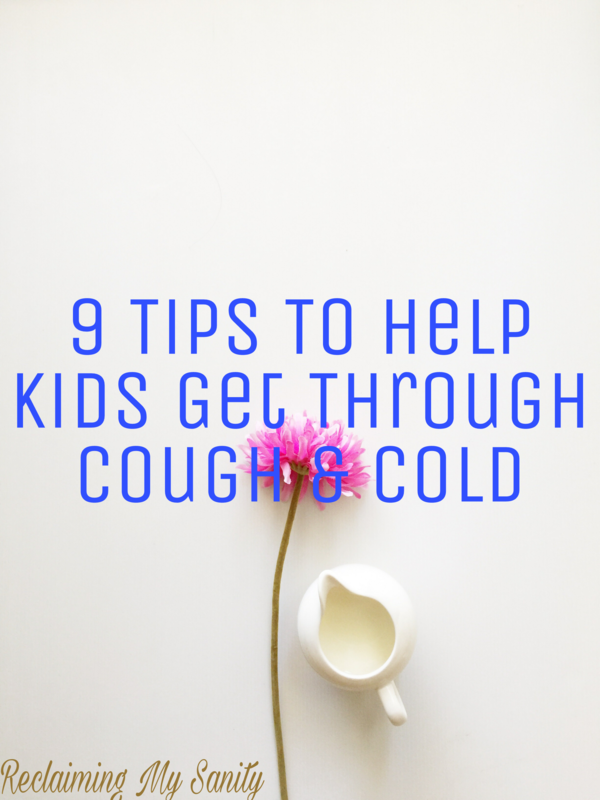 Last night, as both of them refused to sleep, I was thinking to myself, “I wonder what other people do when their kids are sick.” I have seen a lot of how to’s and sickness remedies on Pinterest, but those don’t last all day and night. I thought I would share some of the things I do to help the kids feel better while they feel like crap. 1. Stay home. This time of the year the air is getting dryer and the weather is getting colder. Taking a sick kid outside is only going to make matters worse. Try to keep them warm and indoors as much as possible. Let them watch movies, television, or just sit on the floor and play. Whatever it is, keep them inside. 2. Humidifier. Like I mentioned, the air is getting dryer. Having a humidifier helps maintain moisture in the air, but it also helps to loosen up mucus. Put a humidifier in close range where they sleep. We also use essential oil (eucalyptus oil) to help calm and soothe. You can also keep one (or move one) to the living area during the day. 3. Medicine. Now I know there are a lot of people who refuse to use medicine and that’s ok. For those who do use it, keep up on your doses. Meaning, if your child needs tylenol every 4 hours, make sure they get it. “Like clock work.” Missing a dose or getting a dose later can make them feel run down. Usually you can tell when the meds are wearing off. 4.Suction. One of the biggest things you can do to help a congested child is to suction their nose. Get those boogies out! Both my kids are a bit temperamental when it comes to this, but it has to be done. You can also add saline to their nose and then wait 15 minutes and suction it. Normally, I will suction it and then use the saline so it has a longer time to sit in there. 5. Vapor bath/shower. I’m not sure if there are other brands, but Johnson and Johnson has a vapor soap that is tear free. I will draw a bath and add some of the soap to the running water. For the older kids, you can put some of the soap on the walls of the shower and let them stand in the shower. Make sure the water goes over their face though, for some reason it helps loosen mucus. 6. Wash. Wash everything. I try to wash their bedding every day while they are sick like this. That way they aren’t laying in their boogers and germs. 9. Sleep. Probably one of the most important things to do when you’re sick is to sleep. Sleep helps your body fight the infection (illness). Try making your kids as comfortable as possible to get as much sleep as they can. If you’re reading this, then it is likely that your child is sick. I hope this post helps in some way, to help them feel better. Let me know which tips worked for you and any tips I may not have said, in the comments below.